Foho Wireless Doorbell Kit With superior performance and ultra-low power consumption, is the easiest and most convenient choice for homes, office buildings, hotels and more. The wireless doorbell supports an operating extensive 1000 feet working range, Ensure a wide operation range for most houses. Inform you in time no matter you are preparing meals in the kitchen or watering in the garden. You'll never miss any important guests or urgent deliveries with the help of the doorbell. One of the great advantages of the doorbell is its memory function. Every time you turn on the device after a power outage, it remembers your last-set melody and volume level. This makes it not only extremely convenient, but also very user-friendly. There are 36 melodies for your choice. Not just the traditional bells and make your life more colorful. The forward button and back button to select your favorite ring tones. Note: Metal will interfere with the signal and shorten the transmission range. Please place the transmitter in areas away from metals. 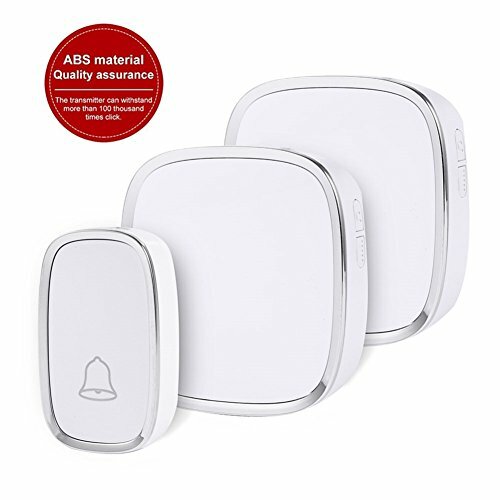 High Quality Product - Our wireless doorbell transmitters with ABS material which is non-toxic, harmless and recyclable. The material can keep itself against from dust, rain and high temperature. Super rating IP44 waterproof, so it can work perfectly outdoor. Ultra Long Distance Transmission - Wireless doorbell is made of high-precision electronic components, 2 doorbell receivers are highly sensitive, 1 transmitter button triggers 2 chime units and the radio waves is covered all over the house and won't interfere each other, the range of action is up to 1000ft/300m in the open area ensures you can hear the bell and answer the door in time. 36 Different Tunes - The receiver bell features 36 tunes and 4 adjustable volume levels ranging from 25 to 85 db. You can easily choose and set your favorite tones as you wish. Easy Installation - No batteries required for doorbell receivers, simply plug into power supply. Mount transmitter with double-sided tape or anchors & screws included. Widely Used Make Your Life More Convenient - Wireless doorbells receiver with 2 doorbell buttons, this 2 in 1 wireless doorbell waterproof kit is the perfect choice for homes with two doors or entrance ways. The extra button can also be used as a portable paging system. Wireless doorbells for home, hospital, office building, hotel, residential quarters, family even the urgent pager for the older, or pregnant women, music alarm for children. If you have any questions about this product by Foho, contact us by completing and submitting the form below. If you are looking for a specif part number, please include it with your message.